Microsoft on Thursday announced it will officially retire Windows Live Mesh on February 13, 2013. The company is notifying current Mesh users with a set of instructions on how to keep their files in sync as well as alternative options for some of the features they’re still using. Microsoft’s quest to move forward with SkyDrive as its cloud storage option is almost complete. The company’s reasoning is simple: it says there are now “over 200 million people that have used SkyDrive, and more and more are making the move every day” while Windows Live Mesh now has “less than 25,000 active users.” Furthermore, Microsoft has tried to bring some of Mesh’s features over to SkyDrive over recent months, and in two months, it will be satisfied enough to discontinue Mesh. Microsoft is telling the remaining Mesh users to download and install SkyDrive on their computers and mobile devices. After that, they can just drag their files and folders from their Mesh into their SkyDrive folder, which will automatically start syncing to the SkyDrive.com cloud and to devices they have a SkyDrive app. The real advantage of Mesh was the whole remote experience, not just being able to remotely access your files. As such, Microsoft has recommended the following alternatives: Remote Desktop Connection (part of certain editions of Windows XP, Windows Vista, Windows 7, and Windows 8) and LogMeIn Pro (third-party software for PC and Mac). Of course neither of these solutions is quite like Mesh, which did more than just remote access. For those who don’t know, Windows Live Mesh, used to keep files in sync and to remotely access a PC, first started out as FolderShare, and then Microsoft bought its creator ByteTaxi in November 2005. 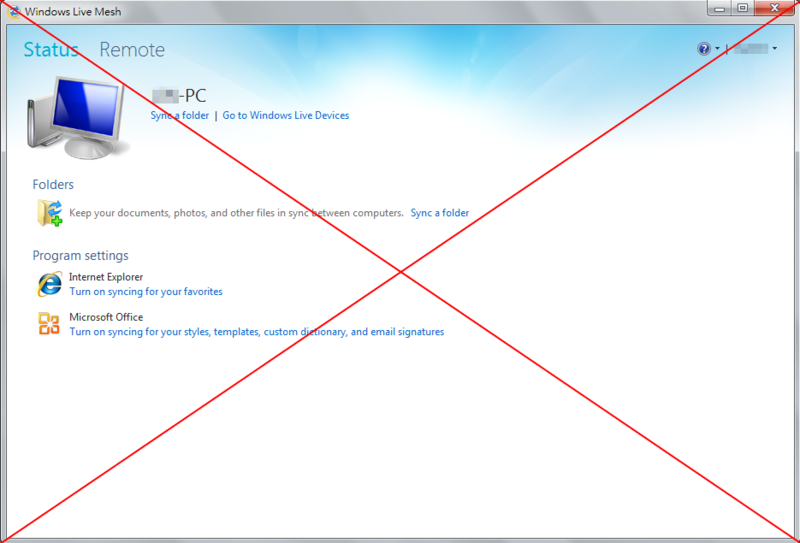 The company then rereleased it in March 2008, only to rebrand it as Windows Live Sync in December 2008. Microsoft says a lot has changed since then: the cloud has become far more ubiquitous and capable of storing larger and larger amounts of data, usage of always-connected mobile devices with minimal on-board storage (smartphones & tablets) has sky-rocketed, and TVs are now connected to the cloud through devices. The company’s strategy has thus shifted to bringing some of the DNA from Windows Live Mesh to SkyDrive as a single service, set of apps, and developer APIs. SkyDrive was just a website a year ago, while now it’s “the world’s most available and versatile cloud storage service” (according to Microsoft), spanning an HTML5 site and apps for Windows, Windows Phone, Android, iPhone, iPad, and most recently the Xbox 360. 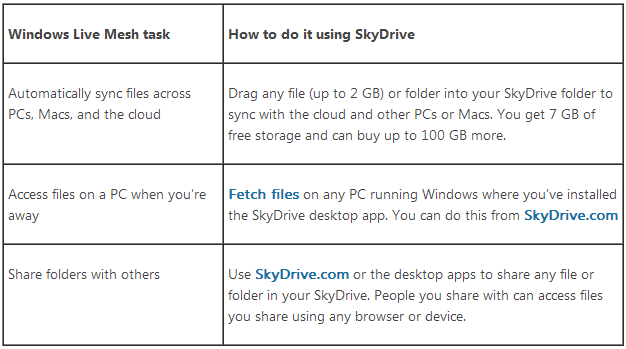 Furthermore, SkyDrive is also deeply integrated into Windows 8, Windows RT, Windows Phone 8, and the new Office, courtesy of the service’s APIs. Still, as someone who covered Windows Live Mesh from its early beginnings, I’m rather sad to see it go. It was a great project with a lot of potential. That being said, SkyDrive is starting to grow into a mature service, and Microsoft is probably making the right (although hard) call here.